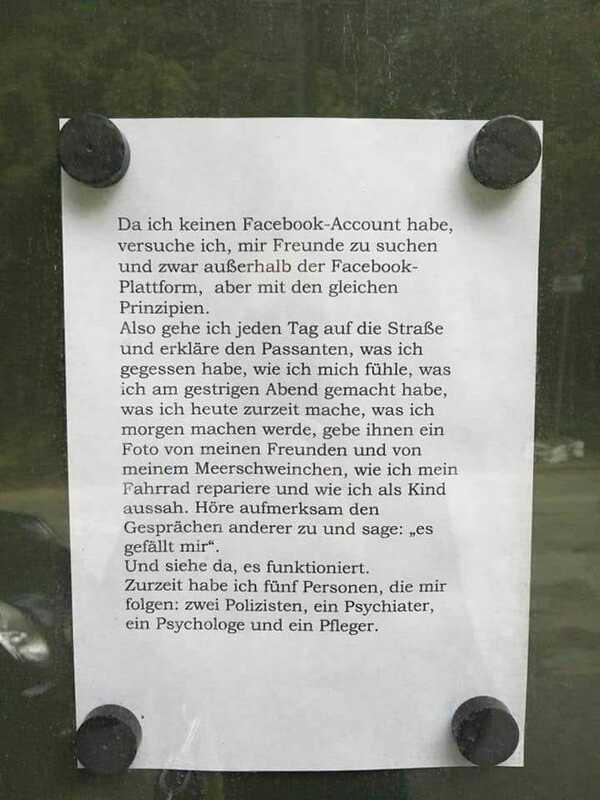 Oh Facebook..wie sehr du unser Leben verändert hast. Jedermanns Leben um genau zu sein. Bis auf die kleine Gruppe von Leuten die sich dazu entschieden haben, der Bewegung nicht zu folgen. Oh Facebook… how much you have changed our lives. Everybody’s lives practically. Except for the small group of people who have decided not to be part of the movement, which are surely not many. “Since I am not on Facebook, I try to look for friends outside the platform, however, I follow the same Facebook principles. So, I go out on the streets every day and explain to anyone passing by what I had for lunch, how I feel, what I did last night and what I will be doing today. I tell them what I have planned to do tomorrow and I show them a picture of my friends and one of my guinea pigs. I show them how I repair my bike and what I looked like as a kid. I hear what they have to say and answer “I like it”.